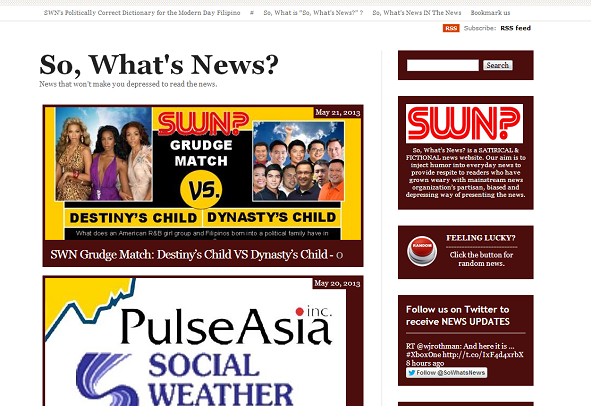 blog post, directory, featured, featured blog, humor, satire blog » Featured Blog- So, What's News? Featured Blog #20: Our featured blog needs no introduction. All we can say is, you don't always see three thousand plus comments in a blog post. If you are looking for the hottest, controversial and most entertaining posts, make sure to visit SWN and be one of the readers who gets carried away with heated arguments among commentators. Blog Name : So, What's News? Blog description: “So, What’s News’ news are news that won’t make you depressed to read the news”. SWN, is a satirical & fictional news website. Our aim is to inject humor into everyday news to provide respite to readers who have grown weary with mainstream news organization’s partisan, biased and depressing way of presenting the news. News on this website should not be taken seriously and to be taken with a grain of salt. I am Stewart, the 31-year-old guy behind SWN. My goal on this blog is actually to spread laughter/humor via putting twists into everyday news, that would hopefully spark conversations and debates. I try to make each post unique and funny but with the understanding that I cannot please everybody. Some may not be into satire while some may dig the humor. The inspiration behind my blog is similar to a Humor/Satire blog in the US called The Onion. I would literally laugh while reading articles from their site. At first they were free, but nowadays, they sadly charge subscription fees for the readers. I believe that laughter is to be shared to everyone and should be free. This is actually my drive to keep doing what I do. I do not earn from my blog, but the comments from readers telling me that they are laughing finding it funny, as well as sharing them is rewarding enough for me. SWN was started last September 2011. I started blogging during the Geocities-era with a blog called WTF-online. I cannot remember what was covered there already and since its closure, I moved to Blogger and then to Multiply. I wrote anything that was on my mind on those blogs, but on the Multiply side, mostly my dates with my then girlfriend who is now my wife. I guess my most favorite was my first post that went viral: "After Anti-Planking, Lawmaker Proposes Anti-Angry Birds Bill." It made me realize the power of social networking in trying to spread a message. It also taught me to keep on writing for the blog to reach a much broader audience. That is why I try to cover enough topics, be it politics, gadgets, entertainment or sports, but of course injected with humor. This is actually a comment from one of my readers, but it perfectly encapsulates my sentiments: "Satire is a strange thing. We don’t always get it. That’s why we should read it more often. " Thanks for featuring me on Filipino Bloggers Worldwide. Mabuhay ang Pinoy! SWN offers unique content, Kudos to the writer as not everyone can write humorous satires as convincingly as this. I've always been an avid reader of SWN and it never fails to make me laugh. And even funnier when some people on Facebook share the posts from it and taking it sooo seriously! In this online world where everyone seems to be looking for something new and unique... this site will definitely boom with readers, young and old alike. I like how SWN brings out the humor in everyday event and it's so Pinoy because that's how we always want to see things always wanting to see the funny or lighter side of life. That's why it's so popular in the Philippines. Humor in a blog is really fascinating and very interesting to read. At this time, we need this kind of blog wherein you enjoys reading and being entertain at the same time. i should suggest this site to my husband! he loves reading blogs like this with all the humour in the morning! He likes to start the morning right with laughter so it goes on the whole day! Congratualtions! Congratulations!! Love all the contents. I hope more blogs will be featured here. Keep it up! This blog seems interesting especially if it deals with satire. For me satire is hard to pull-off. I love reading satirical blogs like The Onion. I'm glad there's a local blog inspired by it. Will definitely add SWN to my reading list. Great job! Definitely a fresh new site that can brighten up the rather always horrible political news. I wish more people will discover the brilliant humor of this blog. Way to go!